Price from: $1257 - Book now! Welcome to Phnom Penh, Cambodia’s vibrant and bustling capital city. Despite its recent turbulent history, Phnom Penh’s wide tree-lined boulevards and faded colonial mansions hold an undeniable charm. Upon arrival at the airport, you will be greeted by your tour guide and driven to your hotel for check-in. Time for relaxation. In the afternoon, set out on a city tour to acquaint yourself with Phnom Penh’s major sites. Your visit today includes National Museum, an excellent introduction into ancient Khmer art and civilization, and the Royal Palace, home to the royal family, followed by the opulent silver pagoda. Transfer back to the hotel where you will enjoy some free time to rest and freshen up before driving to the dock to catch an evening boat cruise along the Mekong River. Savor a welcome dinner on board as you watch the sunset over the shimmering lights of Phnom Penh. After breakfast, your guide and driver will take you to visit Koh Dach, an island of the Mekong Delta, located a short boat ride from Phnom Penh. On arrival at the village, you will cycle around the island, passing the luscious trees and fruit, village school plantations to experience the local life, daily activities at the most authenticity. After having the picnic lunch, return by ferry to Phnom Penh where you will visit the Tuol Sleng Prison Museum and the notorious ‘Killing Fields’ of Choeung Ek. A visit to these sights provides a deep insight into the painful bloody rule of the Khmer Rouge. After having breakfast at hotel you will be picked up for the 5 hour shuttle bus drive to Siem Reap. The journey offers an excellent opportunity to observe rural Cambodia up-close. Stop along the way and visit a market where every assortment of street food is available, including fried spiders - the Khmer favorite. Upon your arrival in Siem Reap, check in your hotel and free for relaxation. Later this afternoon, join us on an ox cart tour (join in) to enjoy the magic sunset over the Cambodian countryside and see how the local people live in their very traditional ways. This tour starts at 4.00-4.30pm with a pick up from your hotel and travel by tuk tuk to Chreav village where you will hop on an ox- cart to start the ride throughout. As the activity is arranged at the day end, you will see people buying food for their evening meal at a local market or interact with the friendly farmers working in their fields or enjoying the company from family and friends near their homes. Enjoy the beautiful sunset from a location out in the rice field and then transfer back to your hotel at around 6.30pm (timing varies throughout the seasons). In case, if you want to replace the shuttle bus ride from Phnom Penh to Siem Reap by the flight, the surcharge will be applied. Siem Reap is well known as the gateway to the many Angkor Temples ruins. Today, catch up the local spirit by spending an entire day with us discovering the mysterious Angkor temples. Start with your early wake up before dawn and take a tuk-tuk ride to visit the magnificent Angkor Wat - the largest Khmer temple and finest example of Angkorian art and architecture. Continue to explore Angkor Thom, start with its imposing South Gate, topped with the four serenely smiling faces of Avalokiteshvara. Next, visit Bayon temple- the heart of Angkor Thom before going further to see the Elephant Terrace, the Terrace of the Leper King. Travel through the north gate to Ta Phrom Temple, another must see site. Then, transfer back to the hotel where you can relax for the rest of the day. Enjoy your breakfast at hotel followed by the transfer to the Tonle Lake where you will join the others on the 6 hour- long speed boat cruising along to discover the floating villages and then to connect with Battambang. On the arrival in Battam Bang in the afternoon, you will be transferred to visit the Phnom Sampeau, meaning “Ship Hill” in Khmer due to its distinctive shape, one of the few hills standing out in this otherwise pancake-flat plain. From this hilltop temple, you will have a fantastic view over the typical landscape of paddy fields and sugar palm trees. Phnom Sampeau is also home to the notorious killing caves, which are cruel reminders of Cambodia’s troubled past. Serenity and inhumanity represented in one place which shouldn’t be missed. Your visit will last until darkness – time when millions of bats emerge from a cave and create patterns as they fly in tandem across the sky – a nightly spectacular show of nature! Note: The itinerary subjects to change based on the water level. In case of low water in Tonle Sap lake, you will be transferred to Battam Bang by car instead of boat. After breakfast at the hotel, you will take part in a gentle trip to explore Battambang by bikes. The exploration covers all the local key sites including market, river, Pagodas/ Temples and local villages… By doing this, you will have a chance to understand more about local life and culture. After breakfast, depart for a 2-hour drive to Banteay Chhmar, a charming and less visiting temple complex in the northwest of Cambodia. These temples were constructed during the reign of Jayavarman VII, at the same time when Angkor Wat was built and is possibly one of the most stunning temples in Cambodia outside Siem Reap. Your inner archaeologist will marvel at the main temple, which is currently under consideration to become a UNESCO World Heritage Site. The Bayon-style towers and lush overgrowth will fill you with wonder as a local guide explains the history and significance of these sites as part of a community tourism project. A simple but tasty lunch will be served at the local community center. Afterward, you’ll have the opportunity to enjoy the local scenery as you ride a kuyon, a local open-air vehicle that is similar to a tractor. The kuyon will take you part of the way to Banteay Top, a small but striking temple that is famed for its tower that appears ready to crumble at any time. You’ll have time to explore this historic temples before the 3-hour drive back to Siem Reap. Spend the rest of your day at leisure. 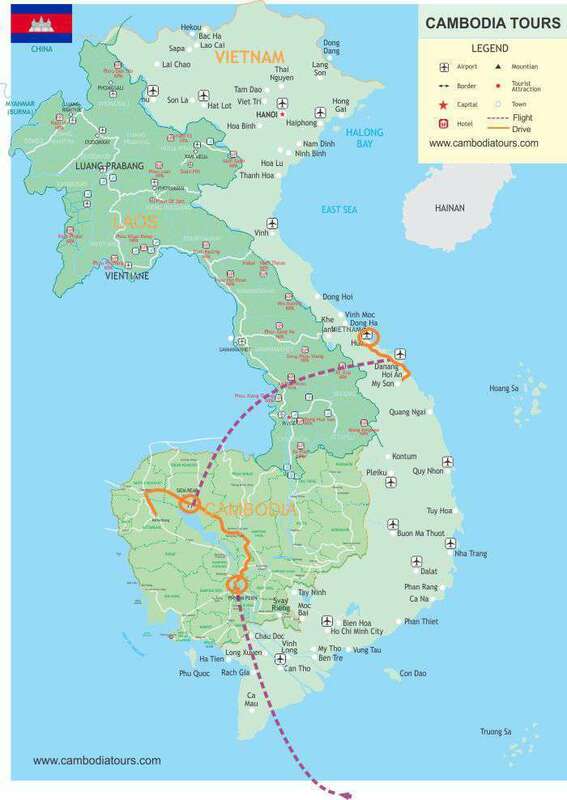 Day 8: Siem Reap –Danang- Hue. After having breakfast, spend the time as you wish. Perhaps, you may take a tuk tuk to the PsarChass, a kind of Baza – Old City Market where you’ll walk around and learn the local art of how to bargain when purchasing items. Or, explore the National Siem Reap Museum nearby on your own to review all what you have seen. Early afternoon included transfer to the Siem Reap International Airport to catch your flight to Danang. Upon arrival, you will be welcomed by our local guide who then conducts the non- stop transfer to the hotel in Hue for check in. The rest of the day will be free on your own. Enjoy breakfast at the hotel then spend a full day exploring Hue, the ancient capital and recognized as an UNESCO World Heritage Site. The sightseeing tour covers all the key sites such as a private boat cruise down the romantic Perfume River to visit the Lady Pagoda (Thien Mu Pagoda), the Royal Citadel, the Mausoleum of King Tu Duc – a replica of the king’s palace built for the next reincarnation of the king and Dong Ba Market. Your vegetarian home hosted lunch at Dong Thien Pagoda is designed to offer the great chance to interact with the nuns as well. After breakfast, check-out and take the morning transfer to Hoi An which is once a thriving international port frequented by Chinese, Dutch, French, Japanese, Portuguese and Arab traders, who came to trade in the high quality silk still produced in the region. Today, Hoian is a relaxing resort popular with tourists for its eclectic architecture, skilled tailors and numerous cafes. On the way, you will see the beautiful Hai Van Pass, visit the Marble Mountain, Cham Museum. Spend the afternoon on a leisurely walking tour to immerse yourself in the tranquility and charm of this sleepy riverside town. Walk through the narrow winding streets of the ancient town centre, visiting Chua Ong Pagoda, the Chinese Assembly Hall, the 200-year old Tan Ky ancestral house and the famous Japanese Bridge. Then, enjoy your sunset cruise along the romantic Thu Bon River before transferring to the hotel to check in. Time for your own afterward. Day 11: Hoi An free day. After having breakfast at the hotel, you will spend your time as you wish. Perhaps, you may take part in an eco- tour. Or a visit to a handicraft village specializing in ceramics. Or just relax on your own. Please feel free to contact with our travel consultant for more information and arrangement. Transfer to Danang International Airport for your departure flight. If the listed hotel is fully booked, alternate accommodation will be offered. All hotel ratings are according to the local.